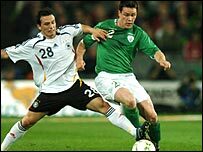 Germany confirmed their place in the Euro 2008 finals with this Croke Park stalemate which leaves the Republic's hopes hanging by a thread. Mario Gomez shot over for the Germans before Robbie Keane fired straight at Jens Lehmann and Steve Finnan made a goal-line clearance. Keane wasted another chance after the restart when he underhit a lob and Lehmann kept out Shane Long's effort. Lee Carsley and Richard Dunne will miss the Cyprus game after being booked. The Republic made a bright start, quicker to the ball and closing the Germans down quickly in midfield. Bit it was the visitors who created the first good opening with Gomez steering the ball just over on 16 minutes from Marcell Jansen's cross. Germany midfielder Sebastian Schweinsteiger was forced off two minutes later after a clash of heads with Kevin Kilbane - Simon Rolfes came on as his replacement. A great throughball from Andy Reid put Keane clear in the 31st minute but the Tottenham striker could only shot straight at the advancing Lehman from a tight angle. Carsley's booking for a foul on Clemens Fritz near the corner flag ruled the Everton midfielder out of Wednesday's qualifier with Cyprus. The Germans were denied by Finnan's goal-line heroics eight minutes from the break, with the Liverpool full-back stationed at the back-post to head out Christoph Metzelder's front-post header. Dunne's heavy challenge on Kevin Kuranyi just before the break resulted in a yellow card and he joined Carsley in being banned for the Cyprus game. Carsley almost scored his first international goal four minutes after the interval when Lehmann was forced to tip over his deep cross. Keane wasted his second excellent chance a minute later - Stephen Kelly sent the ball back in after a clearance and the striker beat the offside trap. With just Lehmann to beat he underhit an attempted lob and the Arsenal stopper gratefully collected the falling ball. Lehmann was booked on 52 minutes when he failed to give the ball back quick enough after racing out of goal to clear for a throw-in. Germany grew in confidence as the half progressed and Fritz fired over when well placed 18 yards out. Lukas Podolski's low shot beat Given but went just wide before Republic substitute Long forced Lehmann into a good save from a long-range strike. The Republic pressed in the last 10 minutes but couldn't create the opening and the goal they so badly needed. Republic of Ireland: Given, Finnan, Kelly, Joey O'Brien, Dunne, Carsley, Reid, Keogh, Kevin Doyle, Keane, Kilbane. Germany: Lehmann, Arne Friedrich, Fritz, Jansen, Mertesacker, Metzelder, Frings, Schweinsteiger, Trochowski, Gomez, Kuranyi.